Named "Canada's Darling of the Blues" by the press and often compared to Janis Joplin for her raw and emotional performances on stage, Layla Zoe was born in British Columbia, Canada in the late 70's. Raised on her father's love of the blues and a diverse record collection, she started singing at an early age and had her first experiences on stage with her father's band at age fourteen. Now after releasing six albums (You Will, Shades of Blue, Live at Errington Hall, Hoochie Coochie Woman, The Firegirl and Sleep Little Girl), penning a self-published book of poetry (Diary of a Firegirl), and moving from BC to Toronto to Montreal in the past 7 years, Layla has gained a reputation as one of the hardest working young blues women in Canada. Following a win at the Compo10 Blues Songwriting Competition in Finland in 2006, Layla began touring Europe and has made a name for herself on stages and blues clubs in Germany, Belgium, France and Switzerland. Receiving high praise from the late Jeff Healey after performing with him at his club in Toronto, Layla continues to wow audiences all over the world with her "Blues Fire." Layla Zoe's sixth album "Sleep Little Girl" released on Cable Car Records in Germany in late 2011 has taken her music and presence in the blues community to a new level since her collaboration with German Guitar sensation Henrik Freischlader who co-wrote and produced the album. 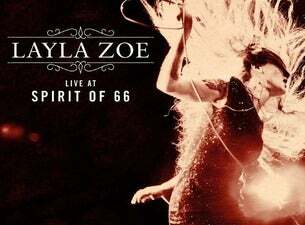 Layla Zoe is a force to be reckoned with and is changing the face of the roots and blues community.